With the end of the year rapidly approaching, it’s a good time to reflect on our industry from a macro viewpoint. What major challenges did IT face in 2018, and what will they come up against in the new year? Are there solutions? IT management certainly loses sleep on a whole host of these issues. Companies can no longer afford to wait to modernize. There is a bottom-line business imperative to moving at a fast pace. Failure to do so will likely result in significant advantage for competitors that are able to embrace this approach. Additionally, the IT upgrade cycle never ends. This modernization effort presents huge risks for CIOs and the entire IT organization as infrastructure and process must change dramatically (depending on the starting point). I couldn’t find any research showing percentages of IT organizations performing at the top of the pyramid. But based on my consulting engagements and observations, as well as discussions with other consultants, most IT organizations seem to be in the middle of the stack. Since this is a BCStrategies/No Jitter post, I’ve applied this model to communications technology. The IT organization must be able to adopt the appropriate infrastructure upgrades. Will it gain a competitive advantage? Will a new communications technology stack facilitate agility, enable collaboration, and support the organization’s growth? Will it allow the organization to communicate better with its customers? Artificial intelligence for use in customer service/experience, augmenting human agents. LivePerson is working with IBM Watson to deploy a “bot assistant to the agent” model. It is utilizing specialized bots for handling the most routine and simple tasks. Scale and agility using available public cloud tools, such as Amazon Connect . For this contact center service, in use at CapitalOne, Amazon Web Services uses a pay-as-you-go model that doesn’t bind customers by fixed licensing costs. Readers who have heard me speak at Enterprise Connect or a BCStrategies conference know that I like to discuss the impact of an organization’s culture on its ability to affect change. Culture is one of the most significant barriers to digital transformation, as widely discussed. This includes culture within IT as well as the entire organization. This project reinforced a number of points for me. Having change pushed from the top management down isn’t enough. Those empowered to make changes at every level have to address resistance on an everyday basis. In the university example above, the changes were mostly contained to the IT organizations. Another recent consulting engagement involved constant re-negotiation between IT and user departments as to what features would be deployed and on what schedule. This necessitated IT to modify the original plan (previously agreed to by all) several times and led to budget and deployment challenges at this public sector organization. 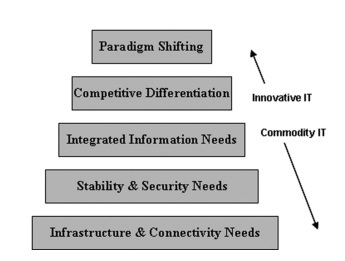 Tying these two examples to the modified Maslow hierarchy above, the university IT organization had started in the middle of the stack and was able to move up the stack to provide an advantage to the entire system. In the case of the public sector client, the IT organization wasn’t able to provide effective leadership and continued at the lower levels of the stack, depriving the entire organization of potential process benefits. It seems that a week doesn’t go by without a major security incident being reported, with the Marriott breach of information on 500 million guests over the course of four years being the latest. Following on the incidents at companies like Target, Equifax, and Yahoo, this latest example supports the theory that you can’t keep the bad guys out. 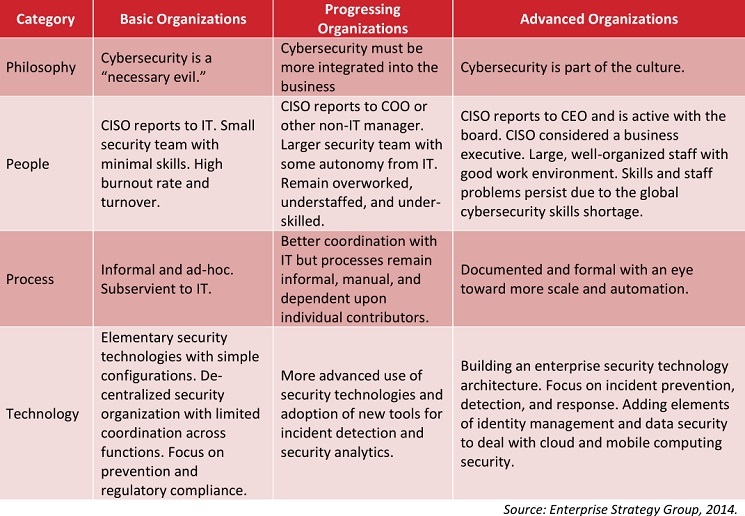 A recent Krebs on Security article suggests that IT management must adopt an approach that includes philosophy, people, process and technology, as shown below. One of the key suggestions is that the security function report directly to the board and CEO, bypassing IT management altogether. The list could be longer. Clearly the number of issues that CIOs and CTOs must worry about is large and growing. No wonder they don’t get much sleep!